Have you have noticed that pumpkins mean different things to different people? For a child, pumpkins represent jack-o’-lanterns and Halloween. Homeowners, on the other hand, consider bright orange pumpkins to be ideal fall yard decorations. To those among us who enjoy fine food, pumpkins conjure up thoughts of pumpkin pie, stew, soup and roast pumpkin, and other delicacies. Unfortunately, few think of pumpkins as a source of food for wildlife. Although the name pumpkin is derived from the Greek word for large melon (pepon), early American colonists are credited with giving this large, colorful fruit the name pumpkin. By the time these settlers arrived in the New World, Native Americans had been using pumpkins for generations. They made use of this native plant in a number of ways. The seeds and flesh were consumed. Pumpkins were cut in strips, pounded and woven into mats. Pumpkin seeds were even used as medicine. Each year far more pumpkins are raised than are ever eaten. This is because most pumpkins are used exclusively as decorations. Instead of simply tossing your used pumpkins into the trash after Halloween or Thanksgiving, why not offer them up as a post-Halloween wildlife food? It is a snap to do and a great way for you to involve your children or grandchildren in a wildlife project. 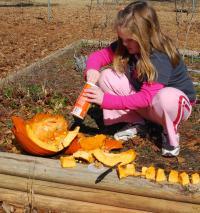 Small pumpkins can be placed around the yard for raccoons and other animals that eat fruits and vegetables. If you want to be creative, fashion a face on an old pumpkin with an assortment of fruits and vegetables such as carrots and apples. Then sit back and see which parts of your creation prove to be favorites with your wildlife neighbors. Larger pieces can be cut up in chunks and placed in secluded parts of the yard. These pieces provide food for late butterflies and other insects that dine on plant juices. Pieces of pumpkins can be mixed with slices of apples, pears and other fruits and presented in shallow pans. Better yet, a pumpkin shell can be cut to fashion a shallow bowl in which the food offerings can be placed. At this time of the year your fruit salad might attract American robins, northern mockingbirds, rose-breasted grosbeaks, northern cardinals, hermit thrushes, brown thrashers or perhaps a gray catbird that has lingered long after its cohorts have departed for their wintering grounds in Mexico, the Caribbean and northern Central America. Whether you are creating a jack-o’-lantern or simply cutting up a pumpkin to make a holiday dish, don’t throw away the seeds. Many birds find the pumpkin’s large, off-white, flat seeds every bit as desirable as sunflower seeds. The list of birds that relish sunflower seeds includes a host of backyard favorites including northern cardinals, Carolina chickadees, tufted titmice, white-breasted nuthatches, blue jays, dark-eyed juncos, rose-breasted grosbeaks, purple finches, mourning doves, and two introduced species, the European starling and house sparrow. As you might expect, chipmunks and squirrels don’t miss a chance to dine on pumpkin seeds. Before sunflower seeds are fed to birds, they should be dried. This will require removing the seeds from the stringy pulp surrounding them. Since this is a messy process, you might consider doing this outdoors. Scoop out the seed-containing pulp and place it in a colander. Then direct the spray from a hose onto the pulp. Extract the seeds that remain in the colander and place them on either paper towels or a screen in a sunny location to dry. The large white seeds can also be dried in an oven under low heat. Place them on a cookie sheet and heat them to 175-200 degrees Fahrenheit. Check them every 10 minutes or so to ensure that you don’t overheat them. When dry, place the seeds in bags and store in a freezer until you are ready to use them. Pumpkin seeds will last up to three months when dried and frozen. It has been my experience that pumpkin seeds are best fed to birds using a bird feeding table or open feeding tray. Here’s a tip: If at first your feeder birds don’t recognize the large white seeds as food, sprinkle a few atop a layer of black oil sunflower seeds. By the time the sunflower seeds disappear, a few birds should have found that pumpkin seeds are also edible. Whether you look at pumpkins as a traditional holiday delicacies, yard ornaments, scary symbols of Halloween, pumpkins or food for backyard wildlife, I think that you will agree that these colorful fruits have become an integral part of the tapestry of autumn in the Peach State. Terry Johnson is a former Nongame program manager with the Wildlife Resources Division, a backyard wildlife expert, and executive director of TERN, the friends group of the Nongame Conservation Section. His column is a regular feature in the division's monthly Georgia Wild e-newsletter.